Here in the back of beyond apples are big business. Apples are grown just about everywhere you look, from huge orchards for cider production to the tree in the back garden. A few years ago one of the big cider producers produced it's cider in the local town, so from early September through to late october the town air would smell of gently fermenting apples, a really lovely sweet appley smell which I looked forward to every Autumn. Unfortunately they have moved production to another local town which is further afield and not somewhere I go often. I miss that smell, even though it made me feel perpetually hungry! Last weekend the local village had a 'celebrating apples' event which invited all those living locally to come and enjoy all sorts of apple related products and activities. There was an apple pressing stall where one could take their own apples and get them pressed. The resulting juice was so fresh and delicious, all shop bought apple juices were placed firmly in the shade. There were games to join in with: apple bobbing, apple and spoon races, archery and a wet sponge throwing competition with the local plumber given the task of standing in the stocks and getting a thorough soaking! The event also had a few competitions for junior bakers, artists and writers. 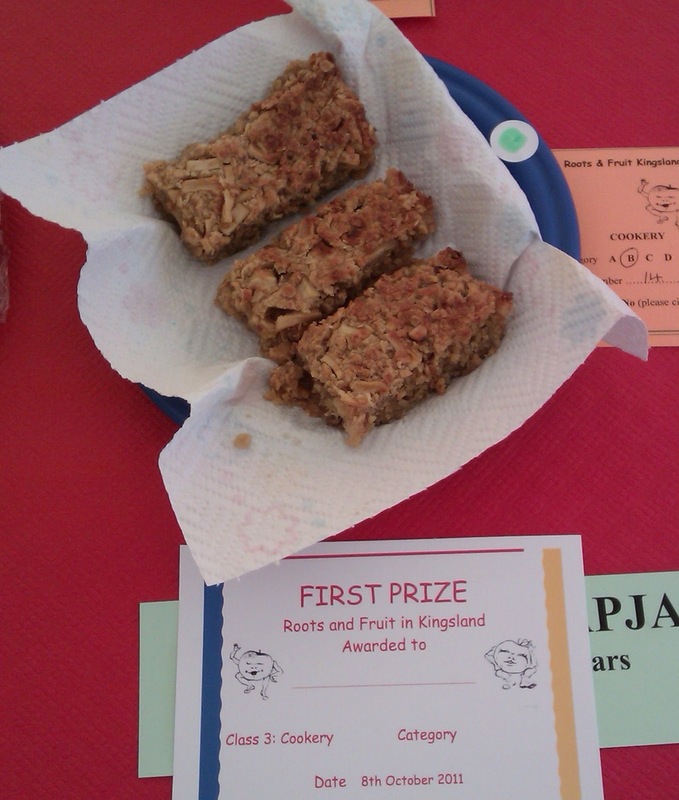 My son earned himself a highly commended for his apple inspired collage and a first in the baking competition. He had to produce flapjacks to a particular recipe which I have to say I was dubious about, mainly because it contained ground almonds which I am not a big fan of ,so below is my version of the apple flapjacks. This recipe makes a large 23cm square tin of flapjacks but can be halved for a smaller tin. These are a gooey rather than crunchy flapjack (which is my favourite kind) and has taken a lot of trial and error to get right!! The picture on this blog is of my son's prize winning entry! 3 eating apples, peeled, cored and finely chopped. Place butter, sugar, syrup and treacle in heavy bottomed pan, bring slowly to boil until sugar has dissolved. Stir in the finely chopped apple and stir for a further 1 minute. Remove from heat and carefully stir in the oats. Pour into a shallow, oven proof, greased or lined tray* and bake in oven for 15-20 mins. Allow to cool slightly before portioning. Leave to become cold in the tin. * I have been converted to the silicon baking tins for this recipe. The mixture doesn't stick and the tin does not need greasing or linning. Brilliant invention!